One of the five books in the Mental Health and Wellbeing Teacher Toolkit, this practical resource focuses on how to support children and young people on a voyage of self-discovery, as they learn to be their own best friend. The book offers research-driven, practical strategies, along with creative material and step-by-step lesson plans to support educators and health professionals. This is a resource book for practitioners looking to have a positive impact on the mental health and wellbeing of the children and young people in their care; both now and in the future. Chapters span key topics including Developing Resilience, Positive Thinking, Emotional Awareness and Self-Efficacy. A complete toolkit for teachers and counsellors, this book offers:Easy to follow and flexible lesson plans that can be adapted and personalised for use in lessons or smaller groups or 1:1 workResources that are linked to the PSHE and Wellbeing curriculum for KS1, KS2 and KS3New research, `Circles for Learning', where the introduction of baby observation into the classroom by a teacher is used to understand and develop self-awareness, skills for learning, relationships, neuroscience and awareness of othersSections on the development of key skills in communication, skills for learning, collaboration, empathy and self-confidenceLearning links, learning objectives and reflection questions. 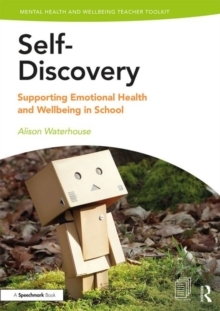 Offering research-driven, practical strategies and lesson plans, Self Discovery is an essential resource book for educators and health professionals looking for fresh, engaging ways to support the wellbeing of children and young people.